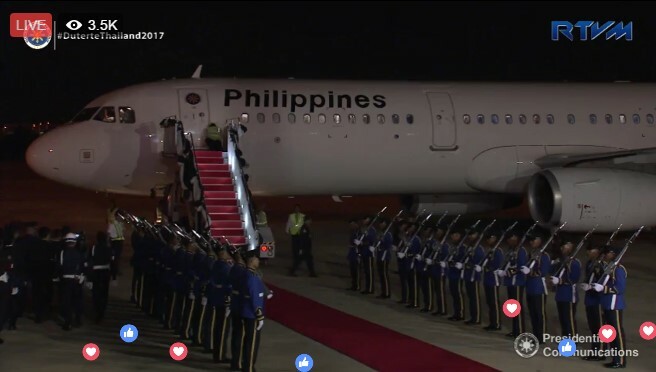 President Rody Duterte and the Philippine delegation arrive at the Royal Thai Air Force Military Air Terminal 2 in Bangkok on March 20, 2017. The receiving party includes Philippine Ambassador to Thailand Mary Jo Bernardo-Aragon and Royal Thai Government Deputy Prime Minister Somkid Jatusripitak. Coming straight from an official visit in Myanmar, the President is also in Thailand for a three-day official visit to meet with Prime Minister General Prayuth Chan-o-cha, major Thai business groups and members of the Filipino Community.